Understanding the mechanisms which determine the capacity of any species to adapt to changing environmental conditions is one of the foremost requirements in accurately predicting which populations, species and clades are likely to survive ongoing, rapid climate change. The polar oceans are amongst the most rapidly changing environments on Earth with reduced regional sea ice duration and extent, and their fauna’s expected sensitivity to warming and acidification. These changes potentially pose a significant threat to a number of polar fauna. There is, therefore, a critical need to assess the vulnerability of a wide range of species to determine the tipping points or weak links in marine assemblages. Knowledge of the effect of multiple stressors on polar marine fauna has advanced over the last 40 years, but there are still many data gaps. This study applies ecological risk assessment techniques to the increasing knowledge of polar species’ physiological capacities to identify their exposure to climate change and their vulnerability to this exposure. This relatively rapid, semi-quantitative assessment provides a layer of vulnerability on top of climate envelope models, until such times as more extensive physiological data sets can be produced. The risk assessment identified more species that are likely to benefit from the near-future predicted change (the winners), especially predators and deposit feeders. Fewer species were scored at risk (the losers), although animals that feed on krill scored consistently as under the highest risk. The Southern Ocean is rapidly changing as a result of rising sea surface temperatures, elevated CO2 concentrations, and modifications to iron sources and sinks. The Southern Ocean has seasonally high rates of primary production, making it critical to determine how changes will impact biogeochemical rate processes in this important sink for CO2. During the austral summer, we measured nitrogen and carbon uptake rates by a late-season Ross Sea microbial community under different potential climate change conditions. A natural microbial assemblage was collected from the ice edge, and grown using a semi-continuous culturing followed by a continuous culturing ‘ecostat’ approach. The individual and combined impacts of temperature elevation and iron addition were tested during both approaches, and CO2 level was also manipulated during the continuous experiment. Nutrient concentrations and biomass parameters were measured throughout both experiments. During the continuous experiment we also measured uptake rates of nitrate (NO3-) and dissolved inorganic carbon (DIC) by 2 size classes (0.7-5.0 and >5.0 µm) of microorganisms. Of the parameters tested, temperature elevation had the largest impact, significantly increasing NO3- and DIC uptake rates by larger microorganisms. Iron addition was also important; however, the magnitude of its impact was greater when temperature was also changed. These results indicate that NO3- and DIC uptake rates may increase as sea surface warming occurs in the Southern Ocean, and thus have important implications for estimating new production and potential carbon uptake and eventual export to the deep sea. We determined decadal‐scale increases of anthropogenic CO2 in the water column using data sets collected 17 years apart (1994‐1996 and 2012‐2013) along a transect at nominal 62°S in the Indian and western Pacific sectors of the Southern Ocean. Large increases of anthropogenic CO2 (up to 9.1 ± 1.5 μmol kg–1), closely following atmospheric CO2 increases, were found in Antarctic Bottom Water (AABW), previously considered a small sink of anthropogenic CO2. Vertical distributions of anthropogenic CO2 increases showed significant positive correlations with those of changes in CFC‐12 and SF6, implying that the distributions were mainly controlled by physical processes such as ventilation and circulation. Calculated uptake rates of anthropogenic CO2 by AABW were between 0.29 and 0.39 mol m–2 yr–1 in five longitudinal segments of the transect. In accounting for the large increase of anthropogenic CO2 in AABW, sea surface conditions in the formation region of AABW are important. Antarctic krill (Euphausia superba) have a keystone role in the Southern Ocean, as the primary prey of Antarctic predators. Decreases in krill abundance could result in a major ecological regime shift, but there is limited information on how climate change may affect krill. 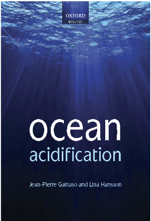 Increasing anthropogenic carbon dioxide (CO2) emissions are causing ocean acidification, as absorption of atmospheric CO2 in seawater alters ocean chemistry. Ocean acidification increases mortality and negatively affects physiological functioning in some marine invertebrates, and is predicted to occur most rapidly at high latitudes. Here we show that, in the laboratory, adult krill are able to survive, grow, store fat, mature, and maintain respiration rates when exposed to near-future ocean acidification (1000–2000 μatm pCO2) for one year. Despite differences in seawater pCO2 incubation conditions, adult krill are able to actively maintain the acid-base balance of their body fluids in near-future pCO2, which enhances their resilience to ocean acidification. The cause of changes in atmospheric carbon dioxide (CO2) during the recent ice ages is yet to be fully explained. Most mechanisms for glacial–interglacial CO2 change have centred on carbon exchange with the deep ocean, owing to its large size and relatively rapid exchange with the atmosphere1. The Southern Ocean is thought to have a key role in this exchange, as much of the deep ocean is ventilated to the atmosphere in this region2. However, it is difficult to reconstruct changes in deep Southern Ocean carbon storage, so few direct tests of this hypothesis have been carried out. Here we present deep-sea coral boron isotope data that track the pH—and thus the CO2 chemistry—of the deep Southern Ocean over the past forty thousand years. At sites closest to the Antarctic continental margin, and most influenced by the deep southern waters that form the ocean’s lower overturning cell, we find a close relationship between ocean pH and atmospheric CO2: during intervals of low CO2, ocean pH is low, reflecting enhanced ocean carbon storage; and during intervals of rising CO2, ocean pH rises, reflecting loss of carbon from the ocean to the atmosphere. Correspondingly, at shallower sites we find rapid (millennial- to centennial-scale) decreases in pH during abrupt increases in CO2, reflecting the rapid transfer of carbon from the deep ocean to the upper ocean and atmosphere. Our findings confirm the importance of the deep Southern Ocean in ice-age CO2 change, and show that deep-ocean CO2 release can occur as a dynamic feedback to rapid climate change on centennial timescales. Although the Southern Ocean is thought to account for a significant portion of the contemporary oceanic uptake of carbon dioxide (CO2), flux estimates in this region are based on sparse observations that are strongly biased towards summer. 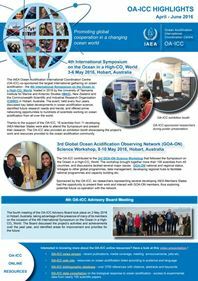 Here we present new estimates of Southern Ocean air‐sea CO2 fluxes calculated with measurements from biogeochemical profiling floats deployed by the Southern Ocean Carbon and Climate Observations and Modeling (SOCCOM) project during 2014‐2017. Compared to ship‐based CO2 flux estimates, the float‐based fluxes find significantly stronger outgassing in the zone around Antarctica where carbon‐rich deep waters upwell to the surface ocean. Although interannual variability contributes, this difference principally stems from the lack of autumn and winter ship‐based observations in this high‐latitude region. These results suggest that our current understanding of the distribution of oceanic CO2 sources and sinks may need revision and underscore the need for sustained year‐round biogeochemical observations in the Southern Ocean.